Born and raised in El Paso, TX, Ryan Piers Williams is a filmmaker with over 20 years of experience. Williams attended the University of Texas at Austin and graduated from the School of Cinematic Arts at the University of Southern California. Upon graduation, he worked for Steven Soderbergh and George Clooney on several productions including Ocean’s 12, Ocean’s 13, Goodnight and Good Luck, and The Good German. 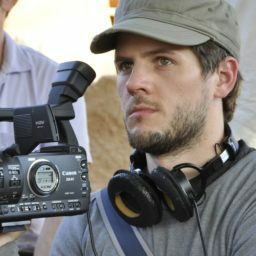 Williams wrote and directed the feature film, The Dry Land, which premiered at the 2010 Sundance Film Festival in the Dramatic Competition. The Dry Land follows a U.S. soldier returning home from war as he struggles to reconcile his experiences abroad with the life and family he left in Texas. The Dry Land stars Ryan O’nan, America Ferrera, Melissa Leo, Wilmer Valderrama and Jason Ritter. The Dry Land won the Grand Jury Prize at the Dallas International Film Festival, the Best International Feature Award at the Edinburgh International Film Festival, a Voice Award, and was released theatrically and digitally. Williams wrote, directed, produced, and stars in his second feature film, X/Y, alongside America Ferrera, Melonie Diaz, Common, Amber Tamblyn, David Harbour, and Dree Hemingway. X/Y, a drama that looks at the complicated love lives of a group of friends in New York City, premiered at the 2014 Tribeca Film Festival and was released in 2015. Williams is currently developing his next feature film, Staring at the Sun. Staring at the Sun was recently awarded the San Francisco Film Society / KRF Filmmaking grant for screenwriting. After I graduated from USC, I started writing my first screenplay, The Dry Land. I was inspired to write the film after reading several news articles about soldiers coming home from Iraq and struggling with PTSD. At the time, there were no films being made that explored this experience with the depth and honesty that the subject matter demanded. I started writing the film with the intention of making the film no matter how long it took. Fortunately, after writing for two years, I was able to pull together an amazing team of collaborators that believed in the script, and together we were able to make the film. The journey of writing a screenplay can be exhausting, messy, terrifying, and in brief moments…joyful. It’s important to be fearless along this journey. That means if something doesn’t work, don’t be afraid to destroy it and go back to the drawing board. You have to always follow the thread of honesty and trust that it will lead you to the heart of what wants to come through. There is a scene in The Dry Land where the main character, James, travels to Walter Reed to visit his buddy who lost his legs during an attack in Iraq. James doesn’t remember what happened during the attack and asks his friend for details. James finds out that he was responsible for the attack and is the reason why his friend lost his legs. The scene is chalk full of conflicting emotions. The challenge in writing the scene was to get out all of the necessary information needed to tell the story of what happened during the attack but to also leave enough room for the actors to breath into the complexity of emotions the characters experience in the scene. I navigated the challenge by doing a great deal of work on the backstory of each of the characters, their relationship to each other, and the specifics of the attack in Iraq. By doing this work I was able to write from a place of authenticity that honored the needs of the scene and the voice of the characters. I don’t spend too much time thinking about external factors. For me, every day is a turning point – every day I have to decide to keep going. I don’t think there is any greater turning point for a writer than the daily dedication to being on the writer’s journey. Right now I am developing a sci-fi film that I’ve written and will direct entitled, Staring at the Sun. The film takes place in 2060 after a massive solar event knocks out the world’s technological infrastructure making healthcare the most valuable commodity. An elite group of International Aid Workers given access to the best healthcare and technology are tasked to isolate the sick from the healthy and privileged. When a young Aid Worker finds himself in a forbidden love he must choose between a life of solitude in the Aid Program or an uncertain fate with the woman he loves. Apocalypse Now, Tree of Life, The Goonies. There are way too many to name. When I was 18, and going to college in Austin, I worked at the Austin Film Festival. I remember Barbara Morgan once telling me that she thought I should drop out of school and be a writer. I thought she was crazy, not for thinking I should drop out of school to pursue filmmaking, but because she thought I could be a writer! I thought the idea was absurd and totally ridiculous. I didn’t take her first piece of advice, but I finally took her second. For the record…I still think being a writer is totally absurd and absolutely ridiculous…..but it sure is a hell lot of fun!